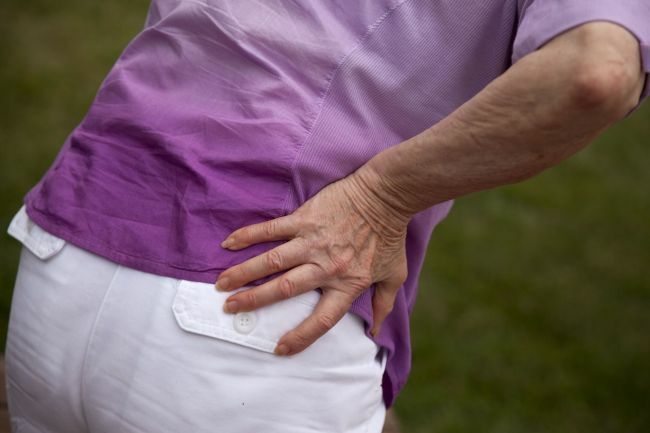 Most spinal stenosis patients were found to be older women, with the prevalence increasing in recent years, a report showed Thursday. According to 2012 data released by the state-run National Health Insurance Service, 60 percent of spinal stenosis cases ― 615,000 ― occurred in women over age 50. Spinal stenosis is an abnormal narrowing of the spinal canal, which causes severe pain by compressing the nerves. Normally, there is enough space in the spinal canal to accommodate the nerve fibers branching off the spinal cord. The size of the canal, however, can be reduced by excessive growth of bone or other adjacent tissues as a result of aging. One of the most common symptoms of nerve compression is lumbar pain. Starting from the back, the pain gradually expands to the knees and feet, causing numbness and discomfort while standing and walking. While spinal stenosis is mostly a result of aging, it is more common in women. This is not an effect of menopause but because of other differences between genders, doctors said. “The spine tends to become unstable as aging progresses, and this instability contributes to narrowing of the spine canal. But in men, the overgrowth of bones, one of the results of aging, actually supports the spine’s stability. That doesn’t commonly happen in women, and the reason for the difference is not yet known,” said Chung Sung-soo, orthopedic surgery professor at Sungkyunkwan University School of Medicine. The occurrence of the disease has shown a sharp increase in both sexes in recent years. The total number of patients who received treatment rose to 1.14 million in 2012, up 78 percent from 2008, the NHIS’ report showed. By age, those in their 70s accounted for the largest proportion of cases with 32.7 percent, followed by those in their 60s and 50s, with 29 percent and 19.8 percent, respectively. Medical costs for the disease reached 435 billion won ($421 million) in 2012, jumping by 68 percent from 2008. In many cases, pain is the biggest problem for patients. Most patients prefer to squat for a second while walking. The spinal canal tends to narrow when patients walk or stand right for long periods, leading to unbearable pain, Chung said. Hunkering down for a second widens the spinal canal temporarily, relieving the pain, he added. Keeping in mind that this is part of aging, patients need to focus on relieving the pain rather than trying to completely cure spinal stenosis, doctors said. The most effective treatment is taking pills that lower the sensitivity of the nerves so that it lessens the pain. Exercise and physical therapy play only subsidiary roles in treatment, they said. Various surgery methods, such as artificially widening the spinal canal, are also available but are only offered for those who suffer from serious pain.